I’ve shared my mask routines, I’ve shared product reviews and I’ve shared a lot about my favorite skincare brands. 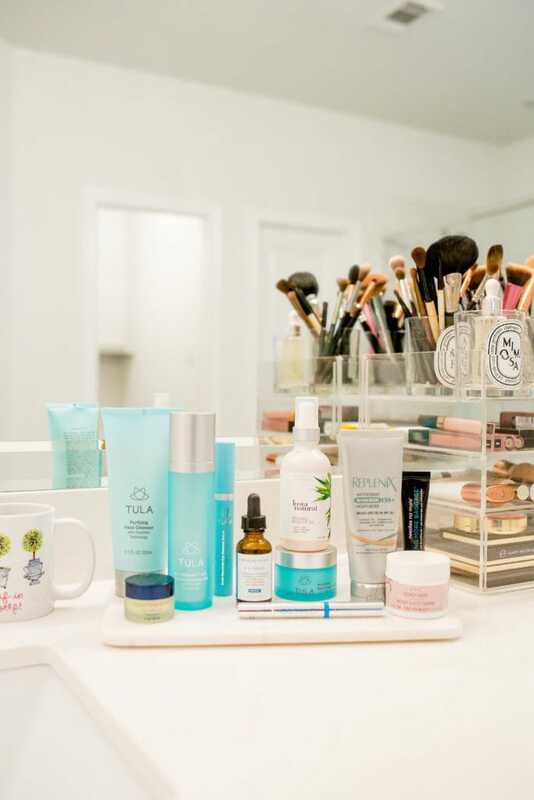 Ultimately, I knew the most helpful thing to do would be to create a master skincare post where you could find everything you wanted to know about my routine. The problem? This post is long. I’m talking you may want to read this tonight when your babies go to bed and grab a cup of tea long. I did make some cheat sheets at the bottom you can save to your phone, so hopefully that pulls it all together at the end! But honestly, you could probably finish reading the entire Harry Potter series before you get through this blog post. There won’t be a post tomorrow so you can take two days to get through it. You’ll need it. I also want to note, this is a lot of products and I by no means am saying you need all these products. If you aren’t new here, you know I was diagnosed with Discoidal Lupus when I was in middle school. It’s an autoimmune disorder that really presents itself in your skin. I spent so many years of my adolescents going to medical centers all over the country from the Atlanta Medical Center to the OU Medical Center. I also saw a lot of dermatologists with biopsy after biopsy of the skin on my face. True story, one biopsy was before cheer camp so my best friend, Emily, removed the stitches in our dorm. Why did we think that was a good idea?! Because of this, I’m extremely passionate about taking care of my largest organ, my skin. Discoidal Lupus doesn’t just show in your skin, of course. The symptoms of Lupus are far worse than the appearance of your skin, but I was a pre-teen and lacked confidence. I remember just praying my skin would stop having blisters and I didn’t care if God healed me internally. I just wanted to go to school without being made fun of. I avoided sleepovers because I didn’t want girls to ask me, “What’s on your face?” I say all of this, so you can see why I treat my skincare routine with the upmost importance and why I don’t skimp on products. I am in remission [thank you, Lord!] but I do get flare ups. These products are what work for me and I hope you can learn about a new line or even try a product from this when you get the chance! I know skincare isn’t universal and what works for me could cause you to break out or vice versa. But I really don’t change my skincare routine a lot, if anything I’m probably the most boring blogger because of it. I’ve used some of these products going on 3 years. My skin type is all over the place. Honestly, I’m normal now but I have combinational skin tendencies. I break out hormonally and get dry patches on my cheeks when I skimp on my routine. I had an amazing facial a few months back and shared here what she told me about normal skin. Having Discoidal Lupus, I do have to treat my skin like it is sensitive because I can easily get a flare up from exhaustion or stress. That may be confusing, but basically this means i test products for each and every skin type. I get blemishes, so I test products that combat acne. I get dry skin, so I test heavy creams. I have to exfoliate to balance out. If you have a skin type that is different I have a post here that shows great masks and treatments for you. TULA Purifying Cleanser: This is the product I’ve used the longest in my entire skincare routine. It’s a really great cleanser that you can use morning and night and it will also get your makeup off. However, I’m a fan of double cleansing so I do that. This reminds me a lot of the Philosophy Purity cleanser, but it’s creamier even though it starts as a gel. I always recommend someone start with this if they haven’t ever tried anything in my routine. I keep 3 of these stocked in my cabinet at all times. In clinical trials 100% of women agreed their skin didn’t feel tight after using this for 7 days and that’s my favorite thing about this wash. Your skin feels clean, but not stripped. TULA Pro-Glycolic 10% PH Resurfacing Gel: After you cleanse you want to use acids, which I’ll get to more on below. Acids help your skin resurface and repair. This is a toner that balances YOUR pH level, whether you’re dry or oily or combination or having mature skin. I love the texture of this product and the fact you can always use it no matter how your skin reacts seasonally. TULA Multi-Spectrum Eye Renewal Serum: This is a caffeine packed serum, so I use this in the mornings as my eye cream to help me look rested. Beautycounter Lip Conditioner: Recently, I’ve gotten hooked on two new-to-me lip balms. I love the Beautycounter Lip Conditioner for morning and Sara Happ Lip Slip for evening. The Beautycounter Lip Conditioner is really moisturizing but doesn’t’ mess up your lipstick which I appreciate. The Lip Slip is some serious stuff and I put it on before bed, and when I wake up all my dead skin is off. That’s so gross, but proves it works! Skinceuticals C E Ferulic: This is an antioxidant serum with Vitamin C, E and ferulic acid. This is really expensive and I usually purchase this with birthday/Christmas money to justify the price. However, I only need 1 or 1.5 bottles a year. This acid helps prevent wrinkles, fix sun damage and remove dark spots. Discoidal Lupus can leave dark spots [like acne scars] after your flare ups go away, so I use this to prevent that. The only negative to this serum is it has a strong smell when you first apply it, but that goes away within 5 seconds. I say it smells like hot dogs but beauty editors call it “smoky.” I’m telling you, if you splurge on one beauty serum this year let this be it! Rosehip Oil: Rosehip Oil is the new coconut oil for skincare and my girlfriend Amy Beth taught me all about it. She loves natural beauty products and this one doesn’t disappoint. If my skin is extremely dry I’ll mix this with my moisturizer or do one layer of this, then a thin layer of moisturizer. It also helps extend my pricier moisturizers when I do this. If I want my skin to really glow, I’ll mix a drop in my foundation. I’ll apply a drop to peeling skin. I’ll apply it to remove some unwanted eye makeup. I’ll put it on elbows. You name it. It’s truly as versatile as coconut oil, but I’m going to go out on a limb and say it is better. TULA Hydrating Day & Night Cream: This is my morning moisturizer, however if you have more oily skin you can totally use it morning and night. I prefer to go to sleep looking like I dipped my face in Crisco, so I use a different one. This jar lasts me a lot because I do typically do a drop of Rosehip Oil in it and that really extends how long it lasts me. It’s filled with probiotics and helps balance your skin, which also helps prep your face for makeup. Replenix Sunscreen: I learned about this sunscreen from The Skinny Confidential and I’m never going back. It’s a caffeinated sunscreen so it’s going to tighten your skin, help you look awake and helps minimize the look of blemishes. First Aid Beauty 5-In-1 Bouncy Mask: I use this mask on Tuesday mornings before I shoot. You just leave it on for 10 minutes then rinse. It helps with any skin texture issues you may be having and gives you that “just had a facial” plump look. This is my little secret before any blog shoot! Needles No More Eye Gel: I don’t use this every single day, but I use this on days I’m exhausted. This is a great product to have in your beauty arsenal if you don’t get a lot of sleep or have little ones. You put a small amount under your eye and you’ll feel the caffeine instantly tighten your eye bags. The first time I applied it I started to freak out because I could see it working instantly and feel it. Now, I’ve never had an issue with it clumping under concealer, but reviews really preach you have to use a thin layer otherwise that will happen. Dark circles be gone! GO SMiLE Teeth Whitening Pen: This isn’t skincare related, but I do it during my skincare routine! This is the teeth whitening pen I use about two or three times a week. I just apply a thin layer after I brush. I have extremely sensitive teeth and this doesn’t bother me at all. BeautyCounter Makeup Remover: For day-to-day, I love this makeup remover to remove eye makeup. It seriously gets everything off with just one pad. 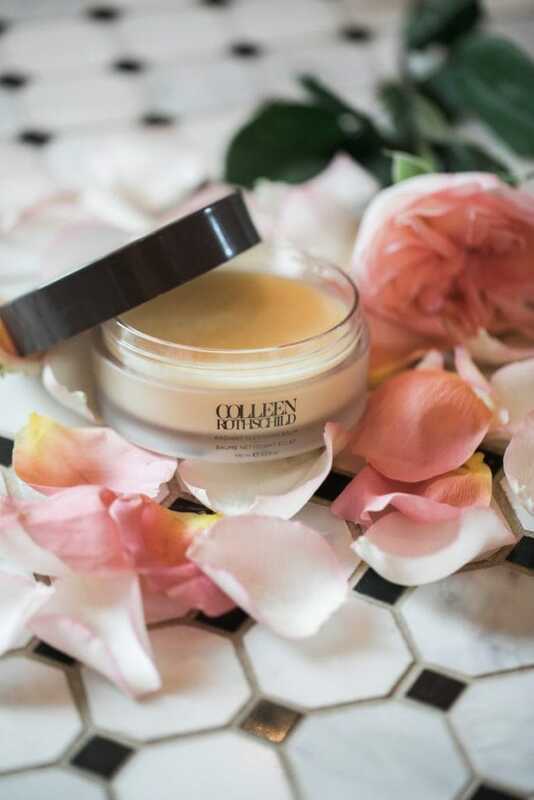 Colleen Rothschild Cleansing Balm: This is heaven in a jar. The scent is divine and you feel like you had a facial after you use it. I love cleansing balms and have talked about the process for years on the blog. 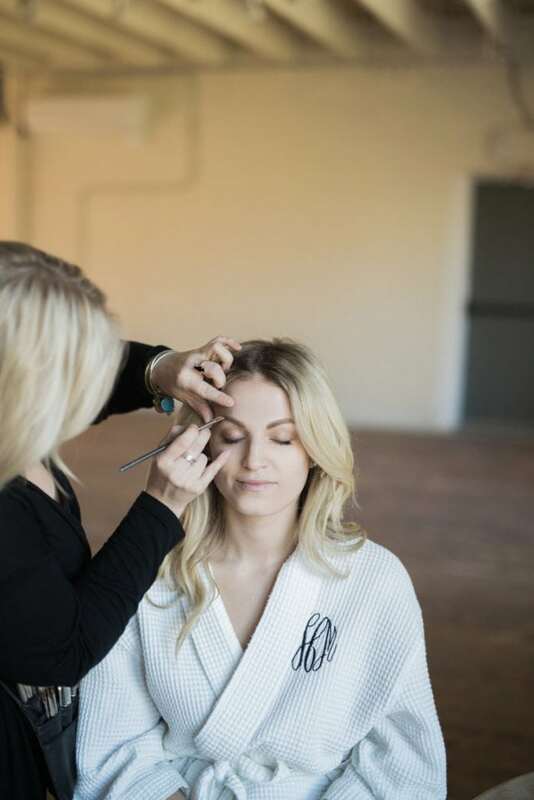 Using a thicker balm to remove makeup, while massaging your face for a minute is proven to help with blood flow, which promotes healing and cellular turnover. 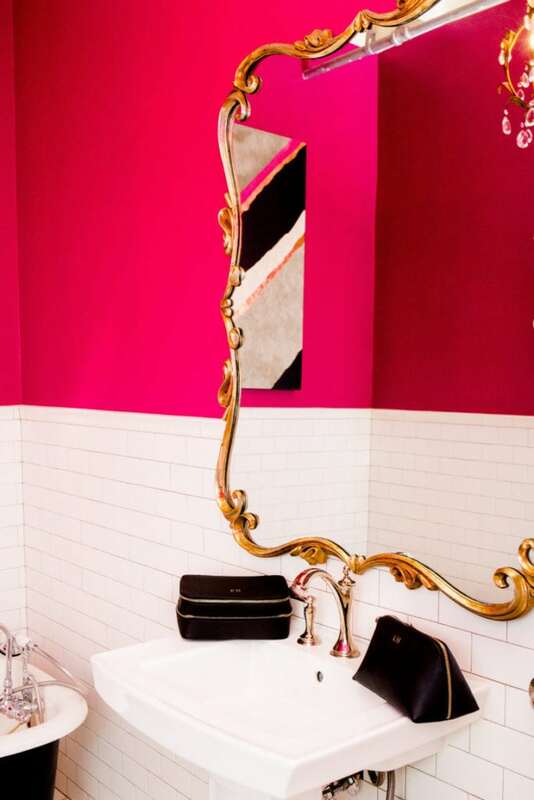 This makes your skin feel like velvet. I use this when I am wearing more makeup [like a shoot day], accidentally sleep in my makeup [yikes!] 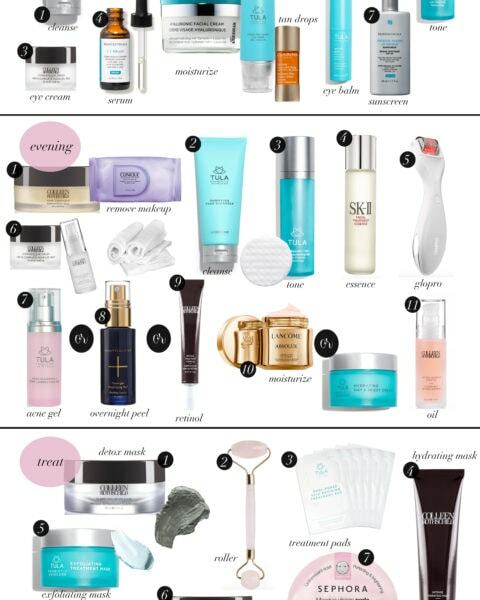 or need to give my skin a little TLC [like a spa night]. TULA Kefir Replenishing Cleansing Oil: This is what I use to wash my face at night. It’s a cleansing oil that contains Kefir which has a ton of probiotics. The “good” oils in the cleanser remove the “bad” oils in your skin that can cause imperfections. Mandelic Acid Radiance Serum: Just as you use acids in the morning, you want to incorporate acids in your evening skincare routine. This is going to gently exfoliate your skin and reveal a brighter tone. I use this like a toner after I wash.
GloPRO: The GloPRO was the beauty buzzword last year. From dermaplaning to microneedling, women were realizing that our skincare products can only go so far. This is a microneedling tool that is safe to use at home. I could honestly do an entire blog post on this as it helps your products penetrate deeper, collagen grow faster and fine lines disappear. I’ve truly seen fine lines go away after using this. I use it twice a week. Tula Eye Cream: This is the eye cream I use in the evenings. Tula Kefir Pressed Oil: I would bathe in this stuff if I could afford to. This is the moisturizer + serum combo I use for evening. It feels like a whipped butter that melts into your face. If my skin is cracking or peeling or healing from a blemish, I apply this liberally and wake up to any issue gone. If I could only have two skincare products it would be this and the TULA Purifying Cleanser. Clarins Tan Drops: I apply two drops of this in my Kefir Pressed Oil twice a week. This is my self tanner for my face and it doesn’t break me out. You can also pick how tan you want to be based on how many drops you use. It’s fool proof! Colleen Rothschild Hydrating Mask: For all the product testing I put my skin through, this feels like a bandaid for my face. I sleep in it once a week and any irritation is gone. Colleen Rothschild Dual Enzyme Polish: This is my exfoliator I use. What I love about this product is you can use it weekly like a normal exfoliator or you can apply it and leave it as a mask for chemical exfoliation. Colleen Rothschild Clarifying Mask: This is what I use to spot treat blemishes. I’ll sleep in it if it is applied directly to the blemish. I also do this once a week if I’m having hormonal breakouts around that time of the month. TULA Exfoliating Mask: If I’m not having hormonal breakouts, the other weeks of the month I’ll use the TULA Exfoliating Mask weekly. This is the blue mask you see all over social media thanks to the blueberry extract. There is Bentonite Clay to draw out impurities, turmeric root to fight inflammation and blueberry extract to promote even skin tone. TULA Dual-Phase Skin Reviving Treatment Pads: If you struggle with acne, this is the top product I recommend for you. I would love to have frequent facials but I don’t want to budget for it/who would watch Maxi?! It’s not realistic for my life. These are what I use instead, they remind me of a HydraFacial. On Tuesdays I either exfoliate with the CF Dual Enzyme Polish or I’ll use one of these pads. If I’m breaking out or have texture issues, I’ll use the pads. First, you apply the smooth side to your face so you disperse the serum. Then, you flip to the textured side and apply in circular motions for 1-2 minutes. You’ll see these white fibers all over your skin. Don’t freak out. It’s supposed to do that as they are natural plant fibers giving you physical exfoliation. I used to get two to three deep blemishes around that time of the month. Using these, I maybe get one minor blemish. I don’t use any acne creams. Paula’s Choice Resist BHA 9: Paula’s Choice is a brand I’d love to try more of. I’ve only used this product from the line, but every person I know raves about the line. I can’t believe I lived without this for so long. This removes any marks or peeling spots from my Discoidal Lupus. If you have acne scaring this would be great for you! I’ll apply it at night, wake up, the skin comes off and the scar is gone. I know this product isn’t made for Discoidal Lupus, but I wish I had had this in high school! Neulash: This is the eyelash serum I use each night. Skinceuticals Retinol .5: You have to work your way up with retinol and so I use the smallest amount since I just started to use it after pregnancy/nursing. I use a pea-sized amount on my forehead twice a week as that is where my fine lines are. I know that can seem like a lot of products, but everything fits in one drawer and hopefully this routine will have it all make sense. 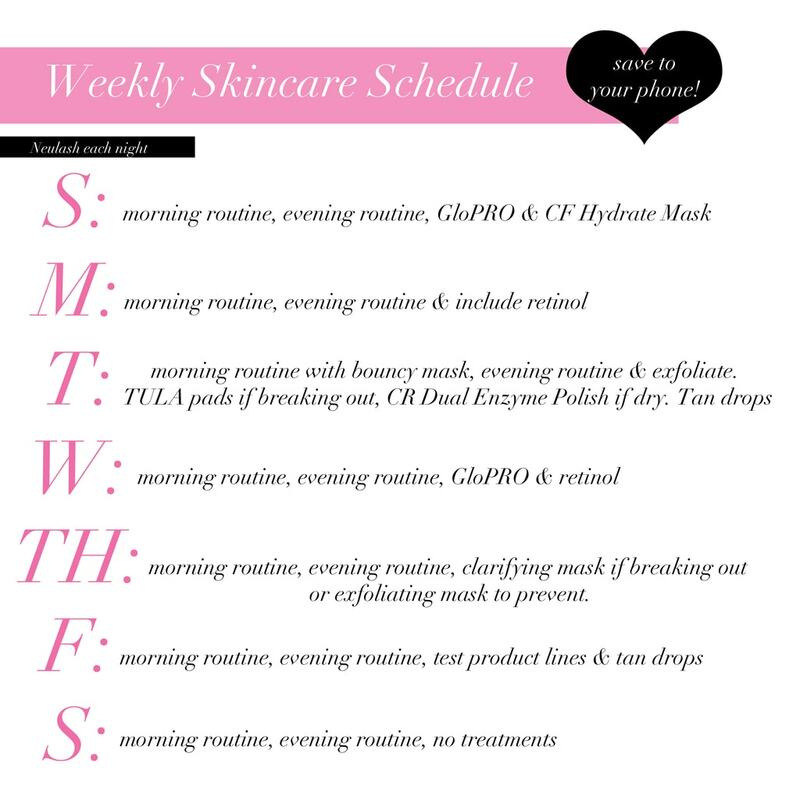 Evening: Regular Evening Routine with GloPRO & Colleen Rothschild Hydrate Mask instead of TULA Kefir Moisturizer. I sleep in the CR Hydrate Mask. Evening: Regular evening routine but when I do a treatment I add my Skinceuticals Retinol. Morning: In the morning, I use my Bouncy Mask. I’ll use this instead of moisturizer in my regular routine. Evening: In the evening, I do my regular routine but exfoliate and use tan drops. If I am having breakouts I use the TULA Resurfacing Pads. I do that after I cleanse and before I do my eye cream and moisturizer. If my skin is dry, I exfoliate with the CR Dual Enzyme Polish. I do that after I cleanse as well. Then I apply tan drops in my Kefir Pressed Oil Moisturizer. Evening: Evening Routine with GloPRO & Retinol. Evening: Regular evening routine. I will use the CR Clarifying Mask if needed for hormonal breakouts. I will use the TULA Exfoliating Mask as needed for texture. I test products for the blog on Fridays. I’ll use all different products to see how they work in my routine. In the evening I’ll also use my tan drops. Evening: Regular evening routine. No treatments so I can see how the products worked Friday. TULA: Code is KATEY at checkout. This will not apply if you choose auto-ship as that already has a discount. It also won’t apply if you are purchasing a kit on sale or other sale product. This gives you 20% off. Q: Can I use these products while pregnant? I always recommend you ask your healthcare provider. I would never want to encourage you to use something your doctor would not be okay with. You do not want to use retinol while pregnant, but you also want to check ingredient amounts from brands for your doctor to approve. 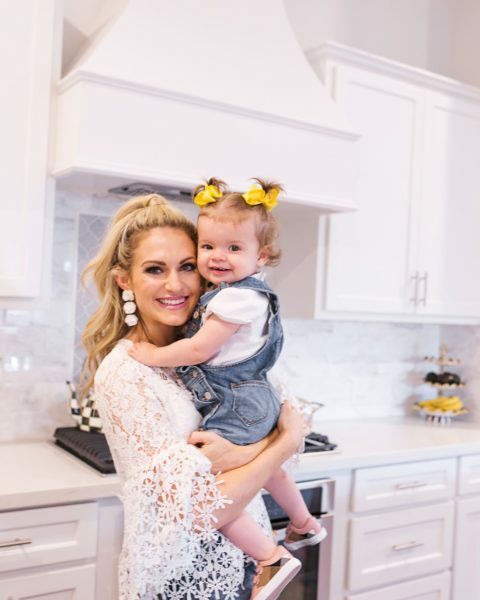 I learned a lot from my dermatologist and OB while pregnant about skincare products, so I recommend that! My Dermatologist told me some products you would literally have to eat copious amounts of to even get enough in your system to affect you or your child, while other products could be harmful just on your skin. She gave me certain percentages so I can’t encourage you enough to ask your Dermatologist the same so she can give you percentages you should look for. I used TULA Purifying Cleanser and Day/Night Cream while pregnant as well as Belli products. Q: This is a lot. What would be a more simple routine? Absolutely! I always recommend using the TULA Purifying Cleanser, Eye Cream, Kefir Pressed Oil and then a mask. If you have combination skin, use the TULA Exfoliating Mask once a week. If you’re dry, use the CR Hydrating Mask once a week. If you are oily, use the CR Clarifying Mask once a week. 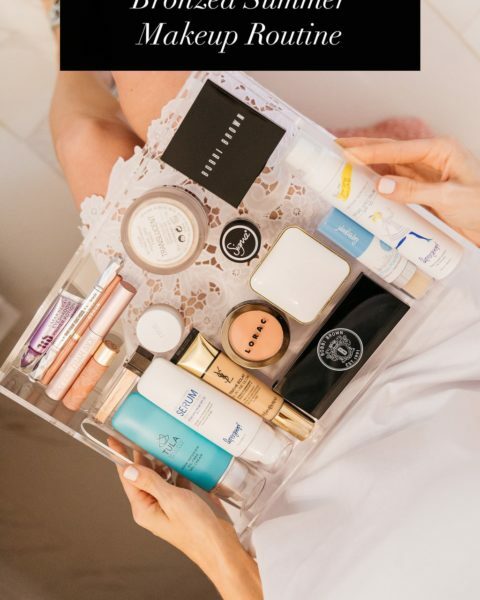 Honestly, starter kits are the best way to try a brand. Both TULA and CR have starter kits, then you could implement other items like my Skinceuticals if you feel the need. Q: If you could only buy 5 products which would they be? TULA Purfying Cleanser, Skinceuticals C E Ferulic, CR Mandelic Acid Radiance Serum, TULA Kefir Pressed Oil and Replenix Sunscreen. Q: I’m extremely acne prone, what should I try? Try the TULA Purfying Cleanser, The Day/Night Cream and the TULA Dual-Phase Treatment Pads. If you only want to buy one, try the pads! If you already have acne scarring, definitely check out the Paula’s Choice product! Q: I have extremely sensitive skin, what do you recommend? For sensitive skin, I recommend a TULA starter kit. TULA means “balance” and will balance your skin whichever way your sensitivities act up. It’s filled with antioxidants and probiotics so it’s gentle. I also recommend the Rosehip Oil as that is all natural and would be gentle on your skin as a moisturizer. Q: Can I start this entire routine immediately? For some people, less is more. I think I was born with “more is more” stamped on my forehead. I’ve been trying an array of products since I was young. Not only does it work for me, but I really enjoy the process. If you like fuss-free routines, I don’t recommend having such a strict routine because you won’t stick to it. If you only use face wash and moisturizer, definitely work your way up to incorporating multiple masks and serums. I’d try one new product a week! Q: How long should I give a new skincare line to work? That’s such a hard question because everyone’s skin is going to act differently. Just like with a facial, your skin can purge when it starts an entire new line [which is why I recommend going slow]. Technically, blemishes can build for 6 weeks. I always recommend giving a line 6 weeks to really see cellular turnover. However, I also think if you are trying a line and see nothing positive then stop using it. A deep blemish or two because your skin is getting to a correct ph balance is one thing. A rash and peeling skin for 2 weeks is another. Okay, this was a bit much and I can admit to that…but I like to be thorough! Maxi is awake and you don’t want to read anything else so I’ll let you go! Bye! I’m so obsessed with skincare but I’m still trying to iron mine out completely. The Tula cleanser has by far been my longest used product! I just started using the CR cleansing balm and the hype is real. I’m adding a few of these products to my list to try, thanks for all the details! Thank you for being so detailed. Do you plan on doing a blog post about glopro? I am wondering if it is really worth the investment. So many people talk about it. I definitely want to, but want to keep trying it for a few more months just because it is so pricy! This was BEYOND helpful and one of my favorite posts of the new year of ALL bloggers!! Worth the long read! Do you ever use the tan drops for all over color, if so what do you mix them with? Hi Kiersten! I haven’t, but I know Clarins makes them for body! I’d be so interested to try with my regular lotion. This post is everything! I am SO thankful you did it and were detailed with every step/product. I have RA and experience flare ups as well, so I love trying products you promote. Thank you for sharing your routine!!! Now I won’t have to guess “what would Katey do?” every morning and night. You introduced me to TULA months ago and I am hooked! Thank you! I’ve been looking for a good overnight moisturizer/mask so will have to try CR. Thank you, this is so amazing! I love all the details! Katey, do you use a clarisonic and if so can you use the Kefir Replenishing Cleanser with it? I purchase everything about 2-3 times a year! However, I use about 4-5 bottles of the cleansers a year! I ordered the bouncy mask after reading this post and it came in today! Can’t wait to get off work to go home and try it! I am trying to find face products for my husband, something simple like a moisturizer. Do you have any recommendations? Or do I share mine with him? 🙂 Thanks! Do you still follow this skincare routine? If not, what have you changed?